Blow away the cobwebs and treat yourself to some fresh air after all the merriment of the season – wrap up warm and head outside for some brisk walks around Dawlish. Be sure to discover Dartmoor while you’re at it, too. Whether you are packing for your Christmas trip or sat at home at a loss for things to do, why not get an early start on a New Year resolution and tackle a book you have been wanting to read for a long time? Not only will that relax you after a busy few days, it can also leave you with a sense of achievement. We suggest putting a few titles within arm’s reach from varying genres. You can see an enticing list of what to read here and here. Alternatively have a browse of the bookcases in the Lounge and Poolside room. If you’ve decided to get away for the festive season, then you can make the most of your relaxing time out of the house. No dishes, no tidying, no stress – we can’t think of anything better! Join us at Langstone Cliff this festive season and you can make memories that you and your family will cherish forever. If you are brave enough, you can have a go on our golf practise area or enjoy a round of Golf at Dawlish Warren Golf Club. You can take a stroll along Dawlish Warren (be sure to wrap up warm!) or you can enjoy a dip in our indoor pool. We even have hair and beauty treatments on-site. The hotel is set to be bursting with entertainment – expect everything from performers for the children to bands, singers and dancing for the grown-ups and don’t forget our full professional Pantomime “Jack and the Beanstalk” live here in the Washington Ballroom on the 29th December. The Pantomime is inclusive to guests staying at the hotel but many of the locals buy tickets to come and see the show. What more could you need? You can see a full list of our leisure facilities here. 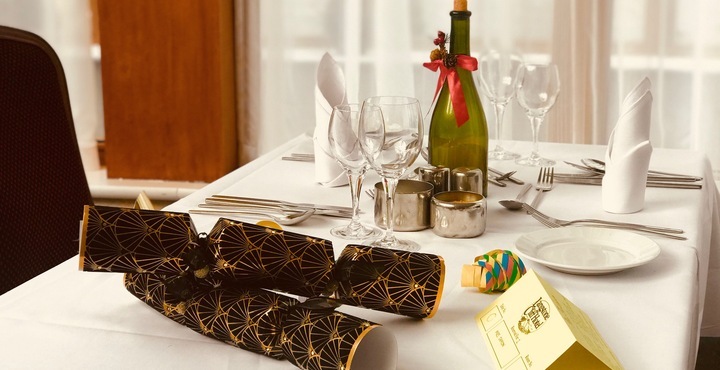 Our festive deals are always competitively priced, so if you are looking for a unique getaway this Christmas and New Year or just want to enjoy some entertainment or fab food, we look forward to welcoming you. Be sure to book your Christmas day lunch in Devon sooner rather than later – our tables are allocated on a first-come first-reserved basis. To take advantage of the most exciting end of year hotel offers in Devon, call a member of the team today or book online. You won’t find these packages anywhere else!